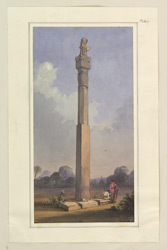 Water-colour drawing by Frederick Charles Maisey of the pillar at Eran, taken from an album of 60 drawings, dated 1847-1854. Eran was an important Hindu site occupied from the second-first centuries BC onwards which attained importance during the Gupta period in the fourth-sixth centuries AD. The sandstone column at this site is more than 13 metres high and dates from AD 484. It has an inscription on its shaft from the reign of the ruler Budhagupta. The fluted capital supports a square block with seated lions at the corners and the figures of Vishnu and Garuda standing back to back and a wheel positioned behind their heads. The column is a symbol of the cosmic pillar, the axis mundi which links the human world with the world of the gods. It is therefore considered a symbol of the 'staff of Bhima'. Bhima is a hero of the epic of the Mahabharata who is worshipped for his terrible strength; his attribute is the mace (gada) which is also symbol of the cosmic pillar.